The Big Squid Repurchase Propensity block enables businesses to understand which customers are likely to purchase from them again, the value of that repurchase, and what drove the decision to buy again. 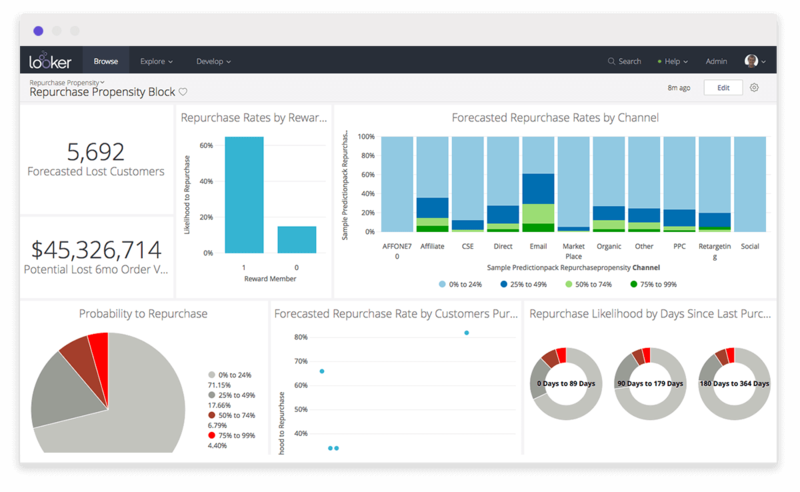 Big Squid’s machine learning platform extends your investment in Looker by analyzing customer repurchase trends and provides insight into what actions should be taken next to increase repurchase propensity. Big Squids Repurchase Propensity block allows retail companies to create predictive models to gain insight into customer repurchasing trends. This includes examining critical questions like; What actions or activities drive successful repurchase behavior, and what is its value to your business? This Block is designed specifically for retail business-decision makers who are looking for actionable insight into critical areas of growth. Target your existing customer base with an understanding of which customers are likely to repurchase, when, and why. Use insights from sophisticated forecasting to entertain scenarios to increase repurchase activity and expand revenues. The Big Squid Repurchase Propensity block: Make Smarter Decisions, Faster.